Leslie Birch is a tech geisha, with a love of open source hardware -- especially Arduino. She's crafted award winning wearables and currently creates projects for Adafruit and Element 14. She inspires women and youth through the MakerJawn program and the artist collective, STEAMworkPhilly. Her hackerspaces are Hive76, The Hacktory and Spanning Tree. Yes, she collects Star Wars toys. Follow her @zengirl2. I’ll never forget the first time I heard about Lilypad Arduino. I was astounded and said, “You can make LEDs light up and you stitch it with conductive thread? How does that work?” It wasn’t until years later, after experimenting with the board that I finally got to meet Leah Buechley, the inventor. She was giving a talk at University of the Arts in Philadelphia about artisanal technologies. She amazed me with her discussion of mixing classic crafts with electronics, and better yet, it was said in a lyrical tone which reminded me of my favorite teacher from 8th grade. Who was this woman that made art and technology magically merge? I was determined to learn more. A few years later her name popped up for a workshop at Shakerag Workshop in Tennessee called “Crafting Electricity”. This was highly unusual, because it was for artists. Leah was normally only found at MIT or at global conferences. Needless to say, I went out of my way to sign up. There she was, eyes smiling, as she enchanted us all with the story of how electricity was like a waterfall, and how we as artists could control that flow. I never thought of electricity in that way before, as I had always feared it. 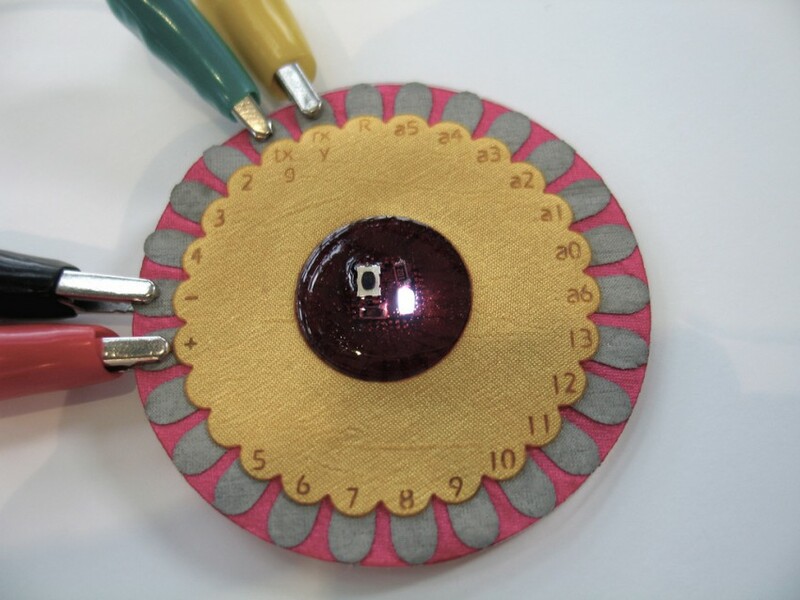 As we experimented with the Lilypad, conductive paint and conductive thread, I soon learned that electricity was my friend, as well as the other artists with me. The workshop was only a week, but we all connected quickly and combined crafts like woodworking, felting, paper cutting, mixed media, and natural objects with electronics. We were making moss into switches, can you imagine? It was a life changing moment for me, and for a few others in the group. We had been struck by Leah. 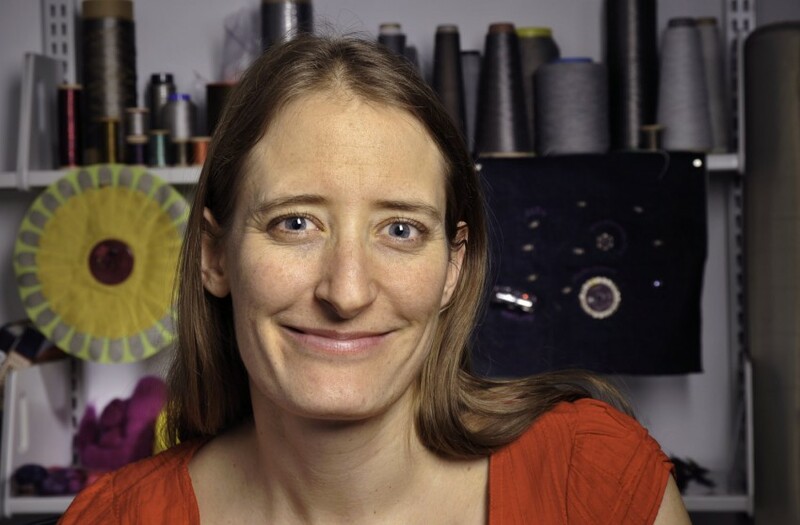 Leah herself was first struck by Etextiles when she discovered conductive thread and fabric at University of Colorado Boulder. This was back in 2005 when she was pursuing her grad degree in Computer Science with the Craft Technology group under advisor, Mike Eisenberg. She started looking at the work of Maggie Orth and Joanna Berzowska, pioneers that knew how to combine tech and design in a beautiful way. She liked what she was seeing. I just loved the materials. I loved the juxtaposition of this really feminine beautiful decorative thing (textiles) with this techy, nerdy guy thing (electronics)… that contrast. One of the things that’s most exciting for me about the medium is that material and cultural contrast. Leah ended up doing something controversial, changing her PHD topic midstream from Cellular Automata to Etextiles. That sounds easy, but the university had never seen wearables, so she was experimenting completely on her own. 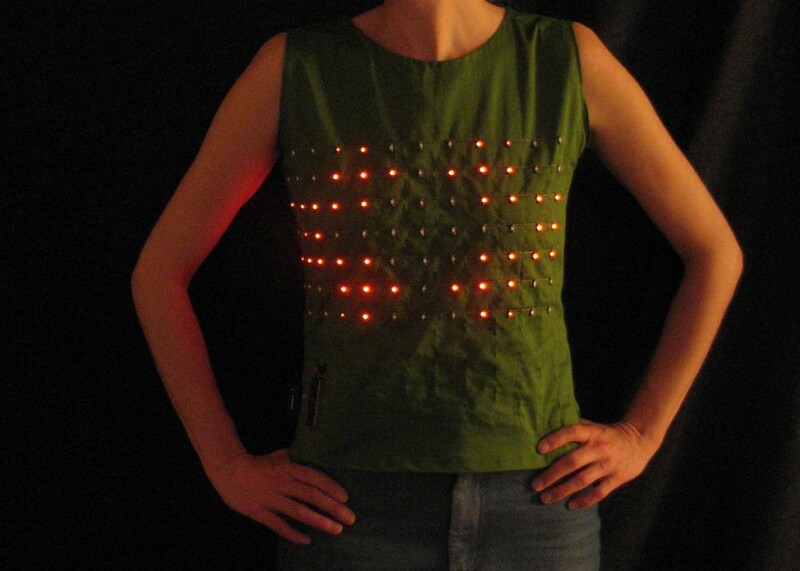 She started to construct projects with LED matrix displays, like a tank top and beaded bracelets. Although she didn’t have formal training in fashion, she had always been crafty and had taken plenty of courses as an undergrad in theater, art and photography. Many are aware of her quilt square project, which many educators are still copying today. The squares use metal snaps and have the ability to communicate and be arranged in different patterns due to the circuit layouts. Not only is it a fun class project, but it is a great example of an important mission in Leah’s life – inspiring future techies. Her research group was geared to education and technology, especially new ways to get kids interested in STEM (science, tech, engineering and math). They were brainstorming ways to get kids and novices interested in Etextiles, which is where Nwanua Elumeze enters the story. You may recognize Nwanua’s name from Aniomagic, a company that currently creates tiny controllers for Extextiles. Back then, Nwanua was in the same lab as Leah, and they often collaborated on projects. He taught her electronics – especially PIC microcontrollers. To further their mutual interest in education, they created an e-sewing kit together. Students were interested, but they wanted more – it needed to be programmable. Microcontrollers needed to be in the mix, and Leah just happened to have a fresh idea. I started to play with ways to make more complex circuit boards out of fabric. I developed a way to build circuit boards out of laser cut fabric, and then once I could do that, I could put microcontrollers in a sewable package. This let me give microcontrollers to kids in my workshops. By now it was 2006, and the first rough Lilypad kits had been born. They were square fabric circuit boards and were used in workshops with high school kids. Of course there was no company at the time; Leah would just make a batch of these to take into a class. 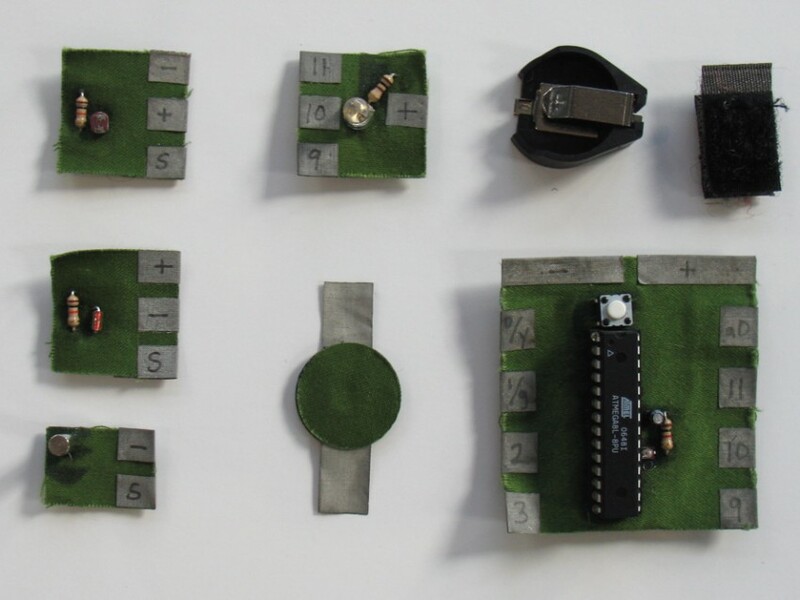 The experiment proved interesting and it led to Leah’s first published paper about wearables “A Construction Kit for Electronic Textiles”, which talked about a workshop that she and Nwanua taught with microcontrollers. One of the things Leah struggled with was the type of controller being used. She wanted to use surface mount because they were less bulky than the typical through-hole style. The question was how to get them to be stable enough on fabric. I was trying to make traditional right angle circuits, but then I realized I was working with fabric and I could do really different stuff. I realized that if I made traces that were really fat at one end, and then got skinnier as they led up to the microcontroller, they could work for surface mount components on fabric. This led me to the flower-like design for LilyPad. The second version of the Lilypad had found its root; it was a flower shape with a small controller attached in the center and covered with plastic resin. Something to keep in mind is that we are talking about a time period that pre-dates Arduino. Leah was using Atmel AVR chips for her projects and the avr-gcc programming tools. It was not easy to install the tools back then, so imagine the difficulty in teaching classes. Despite the challenges, classes were happening, and girls were getting excited about engineering and computing. It was a great way to bust open the stereotypes associated with technology. That was one of my main reasons for wanting to make it commercial. It seemed like this was really a cool social disruptor. What Leah was witnessing with her classes was the spark of the DIY movement. Arduino was just getting started and a little company called SparkFun Electronics was selling some parts they were making in a small two room set-up on hot plates. Leah was picking up parts at SparkFun one day when she got into a conversation with Nate Seidle about a commercial product. Obviously that went well, and what followed was them making a copy of her fabric circuit board. Eagle files were exchanged, edits happened and revisions were made. In October 2007 the Lilypad Arduino was released, and boards sold out quickly to excited DIY fans that had already been seeing projects online. The addition of Arduino made everything simpler to use. The Etextile movement had been launched and Leah’s work sprouted in many directions. Shortly after Lilypad, MIT Media Lab hired her and she founded the Hi-LowTech research group. They explored connections between different ways of making – high tech and ancient. The bigger question of who makes and why they make are something that Leah knows well. Building stuff and making stuff is one of the things that people find great satisfaction in … I know I do. That is some fundamental human impulse that connects to all sorts of things … like our need to be productive, our need to do things well, and our need to connect with other people and our need to be proud of the stuff we’ve done… our need to kind of show off a little, and get praised. Our need to give the world something that we think is valuable, our need to think about things and solve problems. There are just so many things it connects to; it’s really powerful. Once I discovered I could bring a drawing to life as a physical object with lights and sounds, there was no turning back. Leah has impacted so many that I hate to box her in as just the inventor of the Lilypad or the instigator of the DIY wearable movement. Think of her as another Rachel Carson – someone that develops a sense of wonder in all beings and creates a safe place to explore, share and connect. We are the waterfall and powerful things can happen when we learn how to harness that energy. Love you, Leah Buechley. This week, July 14-19 2014, we’re exploring wearable electronics of all kinds on Make! If it is electronic and belongs on your body, we’d love to hear about it! You can find all of our wearable articles by going here.